Nuala Woulfe Beauty: Arthritis and Gout. Gout is a form of arthritis that is caused by uric acid which builds up in the blood. If too much of this uric acid accumulates in the synovial fluid that surrounds the joints, then uric acid crystals will start to form. These crystals are quite similar to small sharp needles which will cause the joints to swell and become painfully inflamed. 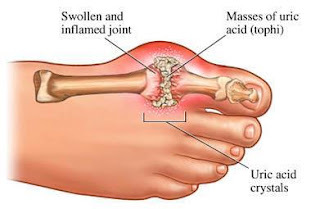 The people who experience gout usually produce too much uric acid or their kidney is just not very efficient at filtering it out of their blood. The symptoms of gout can be strongly affected by certain types of foods that people eat. Clinical Research has shown that there are certain types of foods that are rich in naturally occurring chemicals known as purines. Bone Broth, Glycine, and Uric Acid - Glycine helps clear uric acid.It’s been known for quite some time and is considered by some to be a treatment for gout. Glycine is an amino acid and neurotransmitter that is plentiful in good old bone broth. Cherry concentrate also helps reduce uric acid . Soak in a Epsom salts/dead sea salts bath daily or every second day. Buy a bucket of Epsom salts from the vet. Doctors recommend that people with gout avoid eating these foods that are particularly abundant in purines. When purines are consumed, the body immediately goes to work breaking down these chemicals and the by-product is uric acid. Purines actually provide a piece of the chemical structure in the genes of plants and animals, so purines can be found in almost all foods. The key for people with gout is to avoid those foods which have a high concentration of purines. Once someone has been diagnosed with gout, their doctor will most likely recommend a change in their diet. For the most part, people should know that high fat/high cholesterol foods will also be abundant in purines. So, an individual who has been diagnosed with gout should also consider cutting back on these fatty high cholesterol food items. Making these changes to their diet can help them live a generally more healthy life all around. This can be especially beneficial for people who are also overweight, since their doctor will recommend that they lose the extra weight in order to help manage their gout symptoms and flare ups. For people who have gout, they should avoid eating large amounts of white meats which are high protein and fatty. We are talking about chicken and other types of poultry, as well as pork. Large quantities of these meats while delicious can also easily aggravate gout. Consumption of game meats like duck and dear similar to poultry can cause complications with gout. Organ meat is another category of food items which tend to be very purine rich. Avoid eating too much sweetbreads, kidneys, livers, and even brain meats when possible, as these can really spike up the amount of uric acid in the body. Studies have shown that some other food items such as bouillon, caviar, and chicken/beef broth can cause increased levels of uric acid and should be moderated. For many gout patients, seafood has proven to be a food that can easily cause gout flare-ups. Popular seafood dishes such as scallops, sardines, and fish eggs tend to be high in purines. Other seafood items that should be avoided include herring, anchovies, and mackerel. Making some of these necessary changes can seem quite daunting depending on the person, but compared to the excruciating pain of a gout flare-up, some sacrifices are simply necessary. Alcohol, especially beer, can be a major problem for someone who has gout. Beer is particularly detrimental to this condition as it is very high in purine content, and an excessive amount can be detrimental to the kidney’s ability to filter out uric acid. Research shows that beer can cause the largest increase in uric acid levels, especially if consumed on an empty stomach. Gout patients who are alcoholic will experience more gout pain at a lower uric acid level than those who are not alcoholic. In fact, the yeast that is used by both bakers and brewers tends to be pretty high in purines. For a long time, it was believed that all foods that are purine-rich would exacerbate gout symptoms. However, recent research has suggested that there are certain purine-rich foods that do not aggravate gout. Vegetables like asparagus, spinach, and mushrooms contain an abundant amount of purines, but they should not aggravate gout if eaten in moderate amounts.